Today, I’ve got a simple tip to speed up the YouTube Buffer Speed to load videos faster even in Slow Internet Connection Speed. Do you have YouTube Buffering issues and Interruption while playing Videos? You are not alone here, most of the YouTube users have faced and facing these problems. Sometimes the YouTube Buffering will be fast and videos will be played smoothly without any annoying loading Interruptions. While Sometimes the Videos buffering slows down and even not at all loads The simple workaround to fix this slow buffering YouTube Videos, You have to click the pause button and wait for the full video load in your browser. Frankly I don’t know why it happens to some time while most of the time YouTube Videos are playing possibly at the best. ISP Throttling or Bandwidth throttling is the one of the primary reason for slow buffering YouTube Videos. Other than this there could be a problem in the Google server-side. Even Google has introduced the 144p YouTube Versions to increase the YouTube Video Loading Speed in countries like India. So, It will drastically reduce the Loading time Of YouTube Videos. However, You will not get real quality when viewing these 144p version of version. Then, You may ask , What is the Solution to fix YouTube Buffering issue? Is there any Workaround to watch my favorite YouTube Videos without any delay? SmartVideo is the extension for Google Chrome which provides best control over Increase the YouTube buffering speed, quality and playing options. It offers plenty of Features to control YouTube and its Buffering. Enable/disable ‘switching to HD on full screen option. Install the Smart Video Extension from the Google Web store and start customize your YouTube Experience. 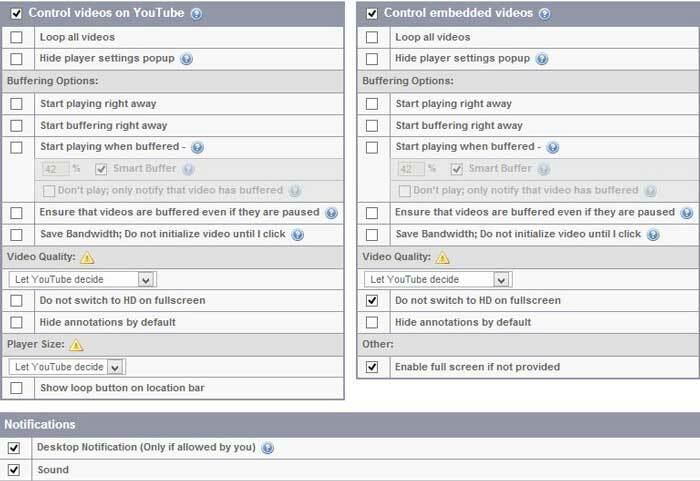 The best bet of this extension: you can set all these features for embedded YouTube videos too. The new YouTube UI stops the buffers after you press the pause button. But this extension ensures that a buffer will load even after you press the pause video button. With this smart Video extension, apart from the buffering customization, you can turn off the Video annotations, full control over the YouTube Playlists. If you have faced lags and performance issues regularly in YouTube, Smart Video is the best option to overcome those problems. Also checkout the YouTweak, an extension makes YouTube Better By Tweaking and Adding Extra Features.